Two drivers began their racing careers in 1976. One was Andy Stott, the other was John Lund. 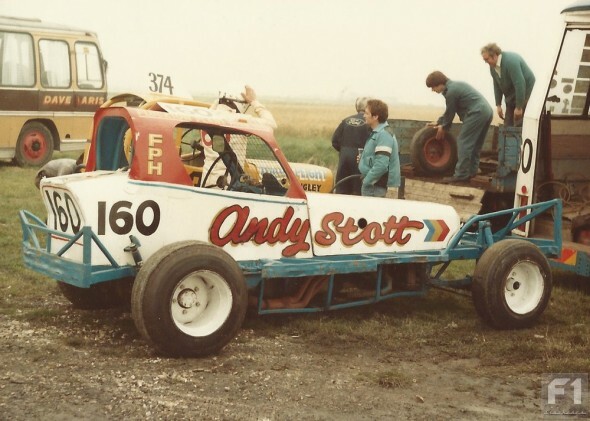 For the first few years, it looked like Andy Stott would be the better driver. Stott started spectacularly with his John Hillam car, winning his first race and beating Lund in the Novice of the Year race, which was effectively a two-car shootout. Stott picked up regular race and final wins throughout his short career. Despite only racing for ten years – a brief period compared to many top drivers – Stott took the chequered flag in the final 41 times, putting him in the top 30 in the list of all-time final winners. A technical innovator with John Hillam, Stott was one of the first drivers to run a small-block Chevy engine under his bonnet. The highlight of Stott’s career came away from the UK. In 1979, he became the first British winner of the Long Track World Final at Baarlo in Holland. It was the first time he had visited the track and quickly came to grips with the high-speed oval. Stott was an underrated driver who flew under the radar compared with many of his contemporaries. He abruptly retired in 1985 when family illness meant that he had to spend more time on his farm in Flockton, West Yorkshire. It was only at that point that John Lund began to build on his experience and become one of the most successful drivers in the history of the sport. If circumstances had differed, perhaps it could have been Andy Stott who is remembered as a multi-World and National Points Champion.